Tarapur Gate No 2, [Mandu]. bl.uk > Online Gallery Home	> Online exhibitions	> Asia, Pacific and Africa Collections	> Tarapur Gate No 2, [Mandu]. 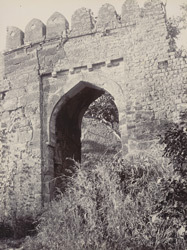 Photograph of the Tarapur Gate in Mandu, Madhya Pradesh, taken by an unknown photographer c. 1902, part of the Curzon Collection of photographs. The walls which encircle Mandu are punctuated by a dozen gateways, one of them being the Tarapur Gate. This arched gateway was erected c.1406-7 but was reconstructed by the Marathas in the 19th century. The historic hillfort of Mandu, now in ruins, stands in a spectacular, naturally-defended position on a plateau of the Vindhya hills surrounded by a ravine. An ancient stronghold, Mandu first came to prominence under the Hindu Paramara dynasty, powerful rulers of the region of Malwa in central India with their capital at Dhar, at the end of the 10th century. Their rule ended with the fall of Malwa to the Delhi Sultans in 1305. Mandu's golden age came as the capital of the Sultans of Malwa between 1405 and 1531. They transferred the capital from Dhar to Mandu, renamed the fort ‘Shadiabad’ (City of Joy), and built palaces, mosques and tombs amid the gardens, lakes and woodland within its walls. Most of the remaining buildings date from this period. The construction of the 59.5 km (37 miles) of ramparts surrounding the fort was begun by Dilawar Khan Ghuri (ruled 1401-5), the Afghan governor who broke away from the Delhi Sultanate to establish the independent Sultanate of Malwa, and completed by Mahmud Shah I Khalji (ruled 1436-69), an illustrious ruler from the Khalji dynasty of Malwa sultans. The Malwa Sultanate collapsed in 1531 and Mandu gradually lapsed into ruin.